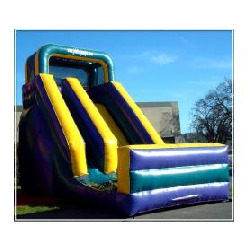 Designed for both the backyard party or corporate event, this 18' slide is a RUSH!! With its smaller footprint, it can easily set-up in locations where space is an issue. Ideal for ages 4-12. Dimensions: 26'L x 14'Wx 18'H. Please allow 30'L x 18'W for adequate clearance.